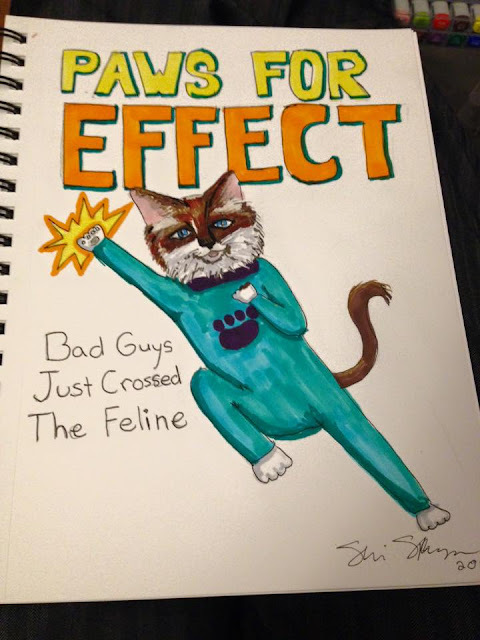 Thanks to Sheri S. for making the purr-fect (WHAT I CAN'T STOP) cover for Lily's comic book debut. P.S. - Lily's almost completely back to her old self again, and by tomorrow will be radiation-free and eligible for unlimited snuggling. Woot woot! When you have such a Magnificent Tail, you don't need any silly CAPE! B-) GO SUPER-LILY! That. Is. AWESOME! And congratulations on getting your sweet baby back for snuggles. I'm sure she will be ready for all the loving you will give her. Thanks for the feature! 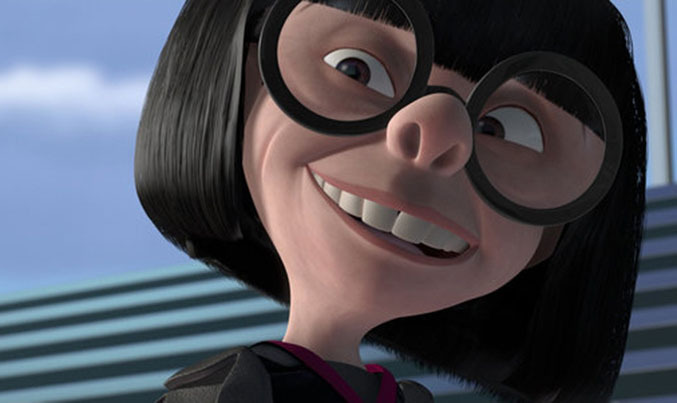 I'm really glad Lily is doing well! What a great comic book cover! I can already see her first caper: protecting those lovely green chairs in your steampunk room from the evil "Spillster!" 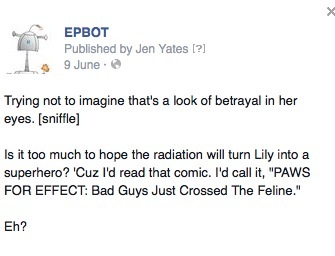 So awesome to hear Lily is doing well and really impressed with her super/alter ego. Cats in jammies could never be wrong. Applause to Sheri S. for nailing it! Happy to hear she's doing well. Have you had to keep Tonks away from her these last few days? Jen will be found on the couch today. Giving Lily snuggles. As it should be. Love that Lily now has her own comic book! Spoiled. Yup, that's the word for it. You are spoiled. And loved. And cared for. AND you have your furry girl back! I am unsurprised at the love shown to you, impressed with Sheri's drawing and happy for unlimited Lily-snuggling!